"The Moog 12-stage phaser, that's just one sound that is on 'Throw Away Television,' which he uses in conjunction with the sequential synth on the FM4," says Josh Klinghoffer's guitar tech. At the :40 mark of Scion's tour of A-Trak's studio, A-Trak pulls out a Moogerfooger MF103 Phaser pedal. He states that he doesn't use it much, and that he prefers to do "everything on the computer". At the back of the pile is a Moogerfooger. Judging by the position of the knobs, It's the phaser. 6:15 into this rig rundown video, Flea's Moog MF-103 Moogerfooger 6/12 Stage Phaser can be seen in his pedalboard. His tech says, "…Then we have the Moogerfooger 12 stage phaser which he likes to play with every once in a while. It’s the fun pedal. It has no set place." 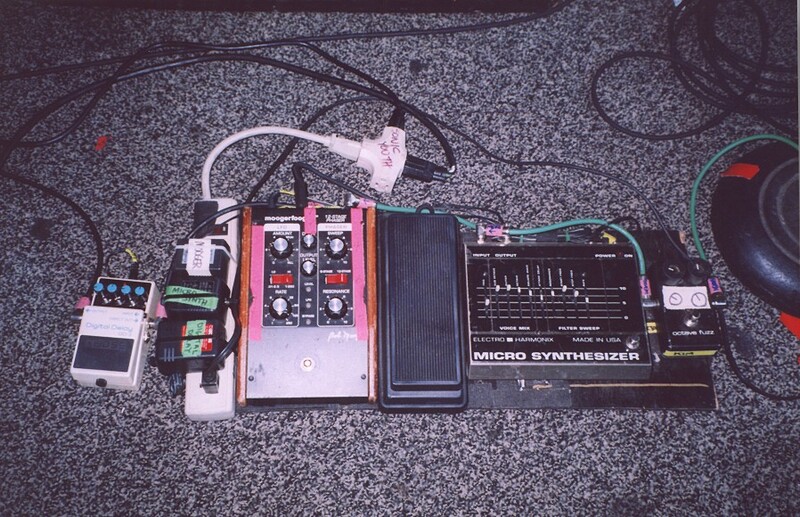 Here you can see Kim's Moog MF-103 Moogerfooger 12 Stage Phaser. [Source](http://www.sonicyouth.com/mustang/eq/gear.html). In this Instagram photo posted by Chislett on his Instagram profile, the Moog MF-103 Stage Phaser can be seen. All the samples & beat are coming from the SP. FX: Akai MFC42 analogue filter, Boss DD7 delay and Moog phaser. At 3:48 in the video, two MF-103s can be seen amongst Deacon's racks of Moogerfoogers. "Mi set de pedales listos para grabar disco nuevo LFC!!! Bien prolijo!!!" According to Premier Guitar, Curtis' setup at SXSW 2015 included a Moogerfooger 12-Stage Phaser. At 7:20 in this video, a Moog MF-103 can be seen in Sebastian's setup. 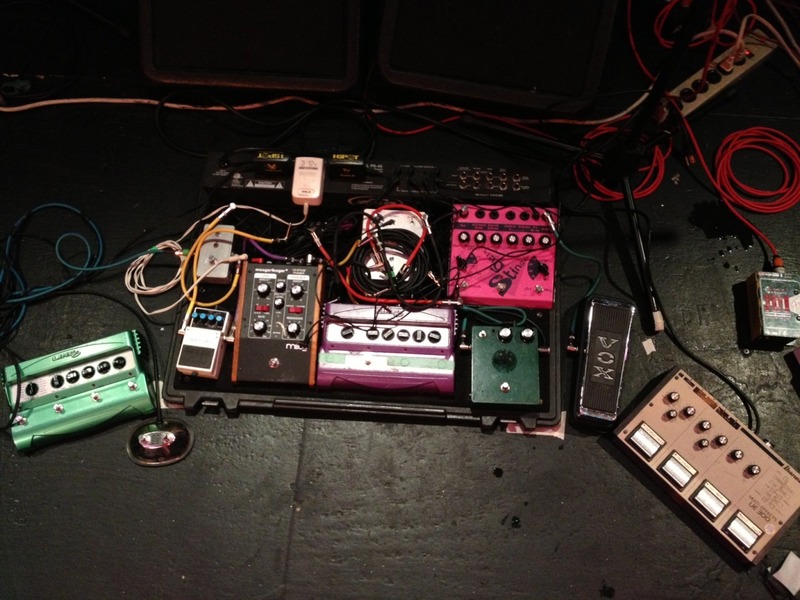 In this Instagram photo posted by Courtney, one of the pedals in his pedalboard is the Moog 12-stage phaser pedal. 6th picture, on the table (out of focus). Here Jacob says he uses the Moog Phaser. Luke Weiler of Positive Mental Trip is definitely using a MOOG 12 stage phaser on many tracks on the 2019 album. The Positive Mental Trip Band page on Facebook showed pictures of 3 moogerfoogers that Luke is using in the studio on drum sounds. However on the extremely short almost punk-Rock style grooves of “stink bug zoo” you can def hear the sounds of the MOOG 12 stage Phaser on acoustic and electric guitars. No MOOG pedals at all were used in the studio on the 1st 2 PMT albums. The MF-103 12-Stage Phaser is a high quality effect designed by Bob Moog. It contains an amazing-sounding 6 or 12 stage phaser circuit as well as a wide-range LFO with an adjustable sweep amount. Used with guitars, basses, keyboards, samples, or recorded tracks, the MF-103 can apply subtle tonal coloration or extremely deep phasing that spins your speakers and ears out of control. Uncontaminated by the digital world! Really lush sounding. Sounds great ona lot of stuff. Sometimes I run things twivce through it to widen the swirl and get a stereo feel to it.